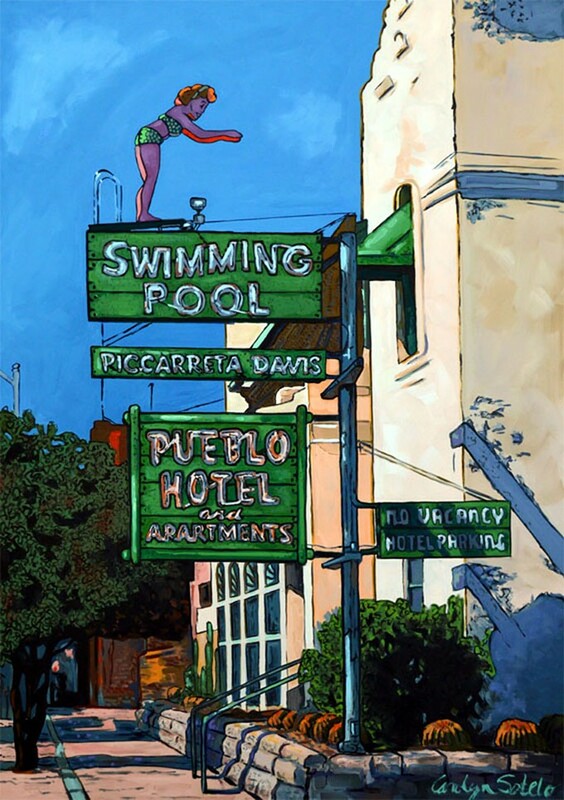 “Pueblo Hotel Tucson,” by Carolyn Sotelo, oil on canvas. Contreras Gallery, 110 E. Sixth St.
Nearly everybody knows downtown's diving woman. Poised to take a swan dive, she stands steadily atop a retro sign painted the same shade of green as her old-fashioned two-piece bathing suit. The sign, jutting out from the old Pueblo Hotel on South Sixth Avenue, announces that the place is equipped with a pool—as every downtown building should be, especially in the blazing heat of this Tucson summer. Carolyn Sotelo has painted a boldly graphic oil of this beloved restored sign, which dates to the 1950s glory days of Tucson's modest tourist hotels and motor courts, when innkeepers reeled in roadsters with inventive placards both painted and neon. The Mission Revival-style building that hosts the swimming lady is much older: designed by architect Henry Trost, it was built between 1902 and 1904. But Sotelo's brisk painting style hearkens to the era of the sign. With its broad, bright flat planes of color, her piece looks almost like a post-war lithograph. Her "Pueblo Hotel Tucson" hangs with four other colorful architectural paintings she made of cherished Tucson buildings, from the "Downtown Motor Hotel" to a 19th century Sonoran-style house at "Franklin and Main." Her cheerful, sun-lit work deservedly takes over a whole wall, and then some, in Tucson, the entertaining show staged by Contreras Gallery every summer. As always, this all-things-Old Pueblo exhibition turns into a lighthearted tug of war between the built city and the surrounding desert, between architecture and nature. Sotelo's own spouse, Mano Sotelo, falls squarely into the camp of the unspoiled landscape. Also an oil painter, the deft Mano favors spectacular views, the brilliant orange of the mountains during a "Catalina Foothills Sunset" or the saguaros parading down a rocky slope under a stormy sky in "Saguaro National Park East." My favorite of his five paintings, though, is the least showy. "On the Road to Phoenix" captures the unappreciated beauty of the dusty desert along I-10 between Tucson and the capitol city. In subdued colors, Mano paints broad, flat stretches of land that seem to go on forever, until they're stopped by the low mountains barely visible on the distant horizon. The pancake-flat land yields big skies that change by the minute, depending on the time of day and weather. Here they're filled with drifting cumulus clouds. "Ironwood, Creosote and Chicory Blossoms," by the talented Keith Marroquin, the only photographer in the show, is a tiny picture is as subtle in its way as Mano Sotelo's road trip work. Austere and lovely, the delicate black- and-white landscape image was created through a complicated process. The photo was digitized, then laser-etched on steel, the gallery's Michael Contreras explains, and mounted on wood. Jane Buckman's take on nature is far more fanciful than Mano Sotelo's romantic realism. The trees in her oils on canvas are wild and unruly, their boughs twisting and turning—one mesquite looks ready to run—and her simplified saguaros are straining to leap up hillsides. The colors are hyped up too: the foothills are orange and yellow, the mountains purple and the skies the most brilliant of bright blues. Likewise, Lisa Canouse's downtown, pictured in oils and mixed media paintings, is just as untamed as Buckman's recalcitrant cacti. Canouse catalogues the city center's best-known buildings: The Rialto Theater and its tower, from 1919; The Hotel Congress, also built in 1919; the Fox-Tucson Theatre, 1929; the Southern Pacific Railroad Depot, 1907. But the way she paints these landmarks bears little resemblance to the careful facades an earnest architecture student would draw. In Conouse's hands, these joints are ready to jump. Lit in bawdy yellow and orange, the dancing Hotel Congress looks like nightlife personified. Though Congress Street is oddly devoid of merrymakers, the roadway careens crazily between the buildings, the modern streetcar tracks curving along below a flood of light from street lamps. Up above, in the sky, there's a twirling giant disc that could be a flying saucer, or maybe a flying LP album, playing the soundtrack of the night. Martin Quintanilla takes Congress Street one step further. In his "Tucson," an oil-on-canvas downtown is a crazy cartoon. It's more fantasy Mexican streetscape than American, with painted facades and signs hanging and dangling every which way. The energetic Rand Carlson strikes a balance between nature and nurture, making no fewer than 10 pieces that are split between landscape and architecture. Carlson, who draws the Random Shots comic for the Tucson Weekly, also splits his media: sometimes he does lush acrylic paintings; sometimes he makes collages in tin. In the painting "Armory Park Detail," Carlson renders handsome red-tile roof on a historic 19th-century house with green trim, and in "Downtown," he paints a dispiriting view of dispiriting 20th century office towers and a monstrous parking garage. He also tackles the Rialto tower in a tin collage, crafted from colored scrap metal that he scavenges, cuts up and hammers into scenes. A big blue Tucson sky is the star of his largest tin collage. Punctuated by fluffy clouds, the sky hangs over the Catalinas, their peaks tinted deep blue and pink. Green prickly pears rise up in the desert below. Three-dimensional silver letters, gleaned from old cars and other retro mechanicals, curve across the sky, spelling out the name of our fair city in curlicue, mismatched fonts. The whole thing looks like an oversized postcard from the '50s—or a cool and creative sign from the old days, meant to tempt tourists to taste the charms of Tucson. Note: the architectural info in this story comes from the excellent book A Guide to Tucson Architecture by Anne M. Nequette and R. Brooks Jeffery (The University of Arizona Press, 2002).